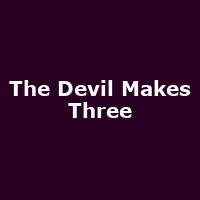 The Devil Makes Three are an Americana band from California, formed in 2002, featuring guitarist Pete Bernhard, upright bass player Lucia Turino and guitarist and tenor banjo player Cooper McBean. Their music blends bluegrass, old time, country, folk, blues, jazz and ragtime music. They released their debut eponymous album in 2002 (re-released in 2007), followed by: "Longjohns, Boots and a Belt" (2003), "Do Wrong Right" (2009), "I'm a Stranger Here" (2013) and 2016's: "Redemption & Ruin".